Decorating for the holidays is so much fun. Your entire house transforms from its plain look to a winter wonderland full of holiday goodies. I don’t know if it’s just me, but home feels more like home when Christmas decorations are up. There’s just something about them… I want to get them up ASAP! I especially love making these decorations myself whenever I can. That’s why I loved this DIY video by Kristi-Anne on YouTube. These are cute, easy, and unique! These 5 ideas got me pumped up from the Christmas season, and I know they’ll do the same for you too, so let’s get started! Use a cookie cutter to form your shape, then grab some clay and form some more details on top. Add a hole for the ribbon, and let it dry/cook the clay. Add your ribbon and it’s done! Make some pom poms, use some clear spray, some glitter, and the same yarn you used for the pom poms to string it up. So cute for your tree! It’s as simple as using felt to glue on your design… Now that’s nice. Click here for the nice pillow template and click here for the naughty pillow template. 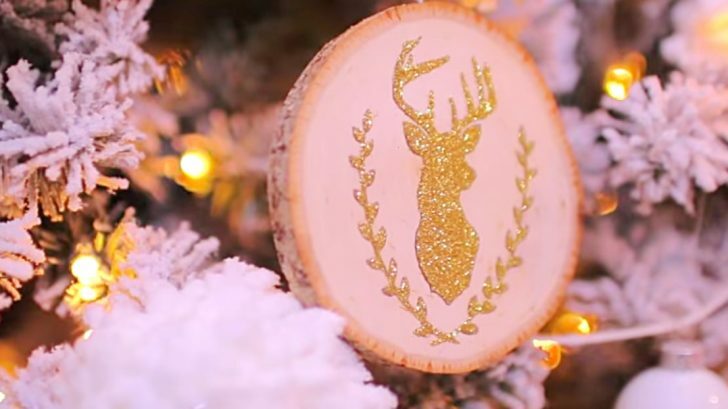 Use a little wood slice and the design of your choice (she uses this reindeer,) to glue down some glitter. Paint the glue in the shape of your design (trace the design first,) then pour on your glitter. Done! Grab a plain wreath and cover it in snowy spray paint. Add some berries, pine cones, or whatever else you’d like, and you’re done! Which one of these DIYs is your favorite?